Middle School Art. Believe it our not, those words will make my knees shake as a teacher quicker than high school Calculus. I have absolutely zero artistic ability and even worse I have zero art training of any kind. What little I know about lines, colors, and such I’ve learned with the children during their Elementary Art courses. My 11-year-old daughter, Miriam, not only loves art but also has natural artistic ability. I’d love to nurture her talent, but I didn’t know how to help her. I know I can learn Calculus alongside her, but I’m pretty sure I can’t do the same with art. Enter ARTistic Pursuits to save the day/year. Miriam (and I) received Middle School 6-8, Book 1: The Elements of Art and Composition to explore for the purpose of this review. The Elements of Art and Composition is a comprehensive art program designed to involve the student in the creative process while developing observational skills. Students learn to draw by focusing on elements of art and principles of design. Lessons seek to explore the topic in unique ways, so that students experience it enough to naturally incorporate it into drawing. Students also study artists and art history while observing works of art, meanwhile learning how the masters use the same skills they are learning through ARTistic Pursuits. The time a student needs for each assignment will surely vary. ARTistic Pursuits recommends to expect roughly 36 weeks of study, with two, 1 hour lessons each week. My student could complete the lessons in that amount of time, I think, but she usually spends about double that. She absolutely loves what she is learning, and wants to draw for at least a few hours after reading each lesson. 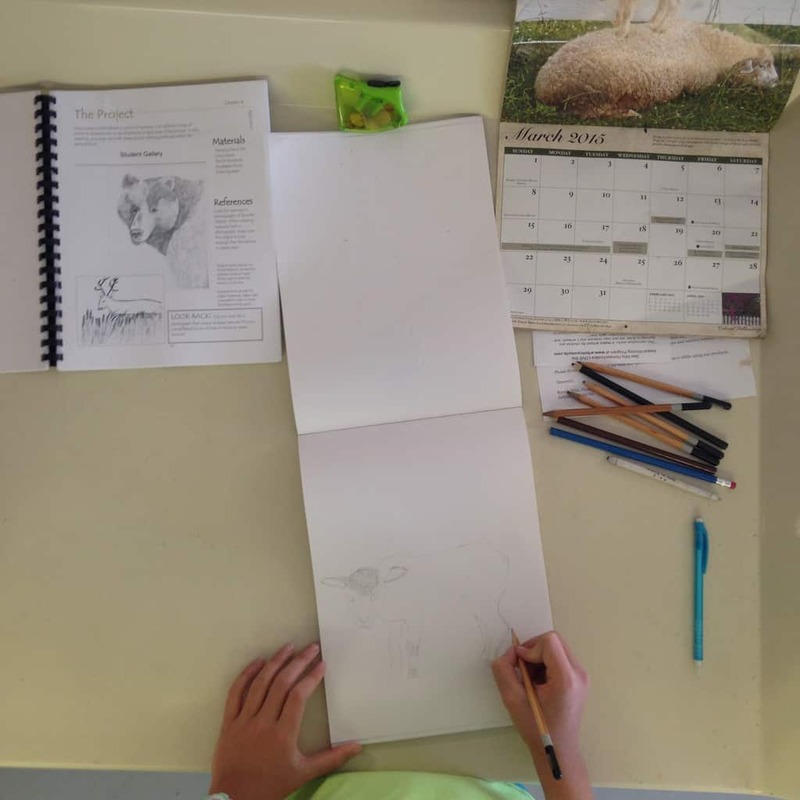 In fact she often picks up her sketch pad most days between lessons to practice what she’s learned and tries to learn to apply it in many drawings, much more than what is suggested in each assignment! 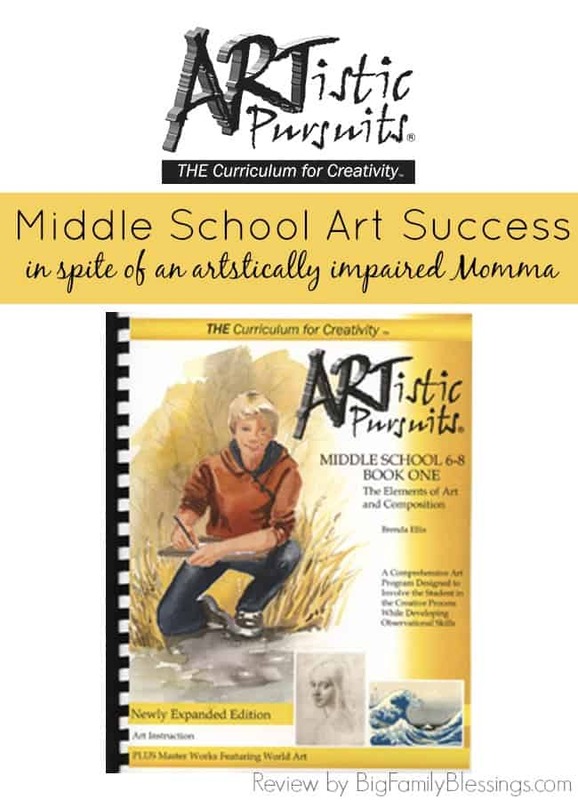 I love that this book requires a minimal amount of art supplies- I always worry when looking at art curriculum that I will end up spending a small fortune on needed materials. Since this book focuses on just drawing the supply list is quite short. ARTistic Pursuits seeks to teach students to observe the world around them. Through the lessons students learn to focus on one element of art (space, line, shape, texture, form, value, and color) at a time. 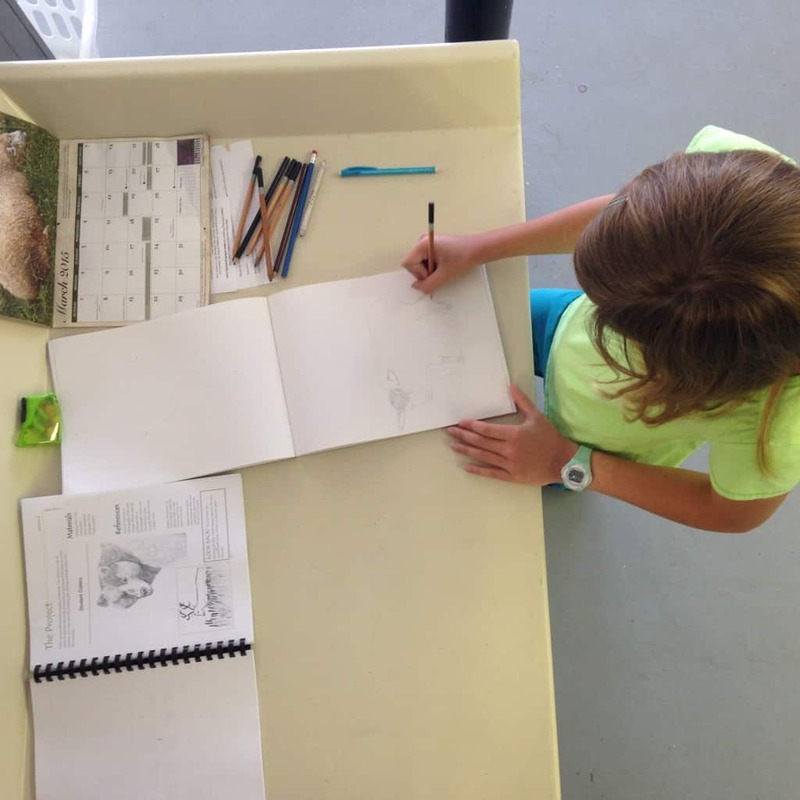 Rather than showing a drawing and teaching a student how to draw that object step by step, the lessons teach the student to observe the world and figure out how to draw using the techniques they are learning. The book is broken down into 16 units, with 4 lessons in each unit. The first lesson introduces the topic and teaches the student how to observe that artistic element in the world around them. Lesson two uses art appreciation and art history to expand on the unit’s artistic element. Lesson three teaches technique appropriate for the artistic element. Lesson four is application- students put all the knowledge from the unit together to create an original work of art. For example, Unit 3 is about texture. Lesson one teaches the students the definition of texture and gives examples (and sample drawings) of texture. Students are encouraged to think about porcupines, clouds and trees. They are encouraged to view objects from different angles, as well as to use their sense of touch to observe texture. Lesson two uses a drawing by Hokusai to demonstrate four distinct types of marks made by the artist to show texture. During this lesson students learn about the artist and his culture. The assignment encourages them to use texture to create their own underwater scene. Lesson three teaches several techniques to create textures in drawing and encourages the student to practice those techniques. In lesson four students use what they have learned to create a drawing with a variety of textures. Students are encouraged to use a photograph for inspiration. So far, I am thrilled with ARTistic Pursuits Middle School 6-8, Book 1: The Elements of Art and Composition. Even better my daughter is thrilled with it. I worried I’d be in over my head trying to teach Middle School art, but it turns out that I don’t have to teach it at all. Miriam is learning and progressing independently using this art curriculum. Since we started ARTistic Pursuits in the last quarter of the year, I planned for her to complete the majority of the book during her next school year. But, I’m guessing she will continue learning and creating all summer and be ready to move on to book 2 by fall! Connect with ARTistic Pursuits on Facebook.